Sadly, very little is known about Bertie John Hayward. He was the son of railway porter Eli Francis Hayward (1852-1895) originally from Sutton Bingham, and Elizabeth née Dade (1852-1927) originally from Alvington. Eli and Elizabeth had eight children, all born in Yeovil; Ernest Charles (b1875), Walter Francis (b1878), Ellen Jane (b1880), Bessie (b1883), Arthur Samson (b1885), Bertie, Daisy (b1892) and William (b1895). At the time of the 1891 census, the family were living at 5 Queen Street. However I couldn't trace the family in the 1901 census. Eli died in 1905 and by 1911 Elizabeth and her children were living at 23 Beer Street. At this time 22-year old Bertie gave his occupation as a grocer's manager. It is not known when Bertie enlisted, although it is known that he joined the Somerset Light Infantry - although which battalion is unknown. It is therefore impossible to tell where he saw service, although this was probably on the Western Front. Since Bertie is not listed in the Commonwealth War Grave Commission's database, it is not known when, where or how he died. An inscription in the Somerset County Roll of Honour in St Martin’s Chapel, Wells Cathedral reads - ‘HAYWARD, Bertie John, Private, Somerset L.I., Yeovil' and his name is recorded on the War Memorial in the Borough. 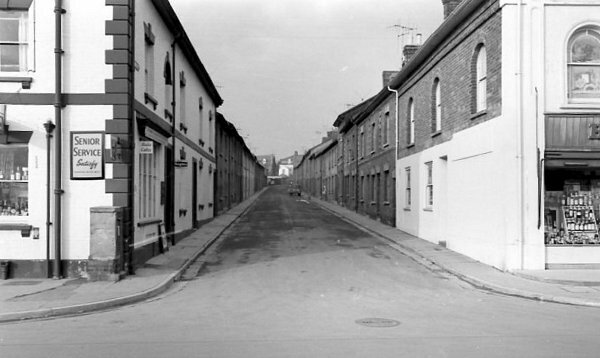 A photograph of the mid-1960s taken from Huish and looking north along Queen Street. The Hayward family lived in one of the first houses at this end of the street in the 1890s.